El Salvador could morph into another Venezuela if the current ruling party retains control in presidential runoff elections next month, a leading expert on the region tells the Washington Free Beacon. Roger Noriega, former assistant secretary of state for Western Hemisphere affairs in the George W. Bush administration, said in an interview that the Farabundo Martí National Liberation Front (FMLN), which currently has control of the country, reportedly has ties to regional drug traffickers, violent gangs in the country, and Venezuela’s regime. 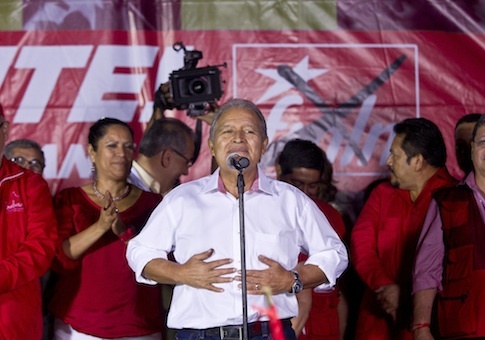 The FMLN’s Salvador Sanchez Ceren nearly won the elections outright earlier this month after garnering almost 49 percent of the vote. Norman Quijano of the conservative Nationalist Republican Alliance (ARENA) finished in second with nearly 39 percent. The two will face off in a March 9 runoff election. Noriega, now a fellow at the American Enterprise Institute (AEI), said Sanchez Ceren represents the hardline, guerrilla faction of the leftist FMLN movement that emerged as a political party after El Salvador’s bloody civil war in the 1980s. El Salvador’s current president, Mauricio Funes from the FMLN, is viewed as more of a moderate. El Salvador hosts a U.S.-run anti-drug-trafficking facility and an international law enforcement academy. Both could be imperiled by an FMLN victory due to the party’s documented links to local and transnational criminal groups, Noriega said. "It’s pretty clear now that the party that might be elected on March 9 is a different brand," he said. "It’s patently involved with narcotrafficking, gangs, and that criminal network." Noriega called Sanchez Ceren a "[Hugo] Chavez knockoff" that would "take El Salvador in the direction of another Venezuela." A government crackdown on protests in Venezuela in recent weeks has resulted in more than a dozen deaths and hundreds of injuries. Many of the FMLN’s associations with criminal groups can be traced to Jose Luis Merino, a high-ranking party official and close confidant of Sanchez Ceren. Merino received military training in the Soviet Union and Cuba and led a special urban commando unit that was responsible for a dozen high-profile assassinations and kidnappings during El Salvador’s civil war. Documents recovered from computers owned by a commander of the Revolutionary Armed Forces of Colombia (FARC) implicate Merino in arms deals that included sniper rifles and ground-to-air missiles. Spanish newspaper ABC.es reported last December that an intercepted email revealed negotiations between Merino and Venezuelan President Nicolas Maduro for a drug trafficking operation involving FMLN, FARC, and the Italian mafia. Merino also advises ALBA Petroleos, the Venezuela-backed oil company that has funneled more than $600 million to FMLN mayors to provide subsidized gasoline and finance the party’s political operations. However, falling oil revenues will likely induce Merino to launder the proceeds of illegal drug sales in coordination with FARC, Noriega said. "You’re going to have ALBA Petroleos morph into ALBA Cocaína," he said. "It will be illicit revenue pumping into El Salvador and making the country part of this international criminal enterprise." Additionally, El Salvador’s attorney general has confirmed the authenticity of recordings that exposed FMLN’s direct involvement in a 2012 truce between rival gangs in the country. Funes’ administration has denied that it was involved in the gangs’ negotiations. The documents and recordings show that Funes agreed to transfer gang leaders to less secure prisons, reduce their jail sentences, increase their privileges, and make monthly payments to them. Gang leaders reportedly returned the favor by intimidating voters and confiscating their identification cards. Noriega said a victory by Sanchez Ceren would generate a more permissive environment for both the gangs and drug traffickers. He recommended that U.S. officials start investigating and issuing indictments against individuals like Merino that are linked to criminal organizations, as well as considering sanctions. "We can’t turn a blind eye to a criminal regime that’s in power now and that will probably become more bold as these hard liners take the reins," he said. A spokesperson for terrorism and financial intelligence at the Treasury Department confirmed that Merino is not currently on a "Specially Designated Nationals" list but could not comment on potential actions or designations. The FARC has been designated a terrorist group by the United States and the European Union. A State Department official told the Free Beacon that "the U.S. government looks forward to working in close partnership with whomever the people of El Salvador choose as their next president." Public debt and poverty have increased under Funes’ administration despite billions spent on antipoverty measures. The country’s economy heavily relies on nearly $4 billion in annual remittances from Salvadorans in the United States. This entry was posted in National Security and tagged El Salvador, Nicolas Maduro, Venezuela. Bookmark the permalink.